The very first spark plug that provided reliable ignition for combustion engine was invented by Étienne Lenoir in the year 1860. The earliest patents for spark plugs include those by Nikola Tesla, Frederick Richard Simms, and Robert Bosch in the year 1898. Today, there are many different spark plugs from which to choose from, and they generally consist of the following basic components: a sharp ribbed profile, terminal studs, and insulator, shell, flanged ring, conductive glass seal, gasket, center electrode, and ground electrode. The following spark plugs have been rated as some of the best on the market for their power, toughness, and value. 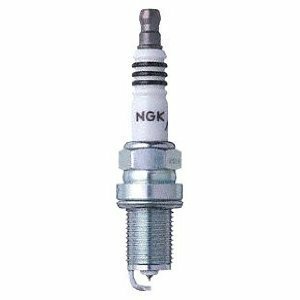 The NGK G-Power Platinum Alloy Spark Plug features G-power platinum, a tapered seal, a projected tip, and the resistor. This thread is 14 mm, and the spark plug reach is 0.691 inches, and the diameter of the range is 58 inches. The electrode core material is made of copper and the electrode tip material is made out of platinum. The pure-platinum electrode tip enables the G-Power plug to reach self-cleaning temperatures that are ideal for a longer range of durability and optimum performance. In contrast to the more conventional spark plugs, the G-Power plug has been praised for having better acceleration, better fuel economy, and better start delivery as well. The spark plug features a gap that is actually twice the size if lower-priced models of standard quality. The plug always runs true to its heat range, and is notably much more economical than most other standard designs due to the extended service life that it has. Generally speaking, these are considered the archetypes of “lifetime” spark plugs. It is perfectly capable of being fitted into automobiles like the 2004 Tahoe. Overall, these G-Power plugs have been designed in order to help the owner maximize their engine power capacity and their operating performance over the course of many different rides. The NGK G-Power plugs have been used by a variety of different automotive enthusiast, consumers, professional race teams and street racers around the globe. Many customers have testified about the technological sophistication and durability of the material. One customer testified that because of NGK, their truck is now running much more smoothly. Another customer testified that they have been using NGK plugs for years. With every single car that the customer desired to get the most quality out of, they reported that they preferred to use NGK almost every time over other brands. The customer testified that NGK power plugs are the perfect choice for those who are seeking out a way to guarantee normal car operations. After becoming intimately familiar with what NGK plugs could offer them, they were convinced that Iridium plugs are always one of the best choices for ensuring the best quality for their value. Another customer testified that their MPG had increased significantly after using the spark plugs for decent amount of time. According to their report, the MPG had been 90k since the last time that they had changed the plugs, so a change was just about due. The customer did notice that there was a slight bit of power restoration, though what they were most impressed by was the fact that there was a gain of about 2 MPG. After completing the installation, the customer reported that they were getting 29.5 highway on trips. They were confident that these plugs should easily last for the remaining life of their automobile. 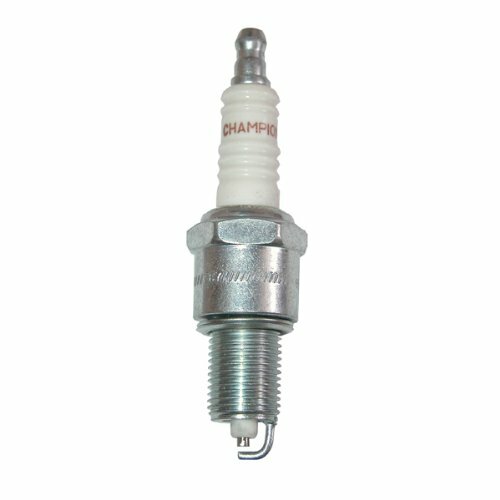 The spark plug can be purchased for the price of $21.78. Every package of these NGK spark plugs comes with eight pieces. 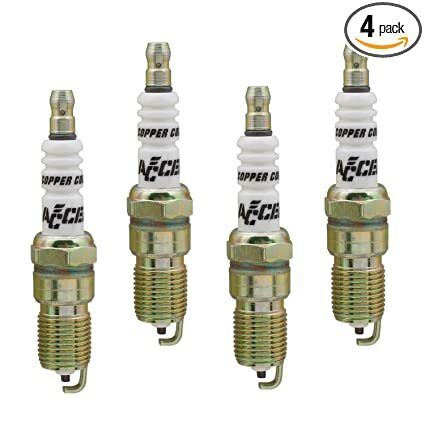 The ACCEL 0526-4 Copper Core Spark Plug is designed to be much more efficient at burning the air fuel mixture in the combustion chamber with the use of a much hotter spark. The spark plug has a much higher degree of power with a higher RPM. Due to the high RPM, they are much less likely to create a fouling misfire or flame dissipation problem. The model has been intentionally redesigned to fit the advancements in technology for cylinder head in fuel management. The design facilitates an instant throttle response, which gives them much better fuel economy overall. The machine threads are rolled 14mm designs that are ideal for protecting the cylinder heads from any potential damage. These copper spark plugs have been made a pre-gapped, though it would be wise to ensure that you check the gap before installation just to have the best idea of exactly what it is that you are getting. The design features 0.708-inch reach, a tapered seat and a projected tip. The spark plugs are the resistor type, with a .0 60-inch nominal gap and afford full thread. The heat range is 6, and the ground electrode features a CD-cut. Each spark plug features a purified aluminum insulator, a copper core nickel/chrome steel constitution, an electric heat seal, and a copper-glass gas-tight seal. The more conventional design of the upper insulator is now white instead of yellow. The design has resulted in an improved throttle response, and a much larger, hotter and fuller flash front. Prospective owners should be advised that the very last digit in the port number is indicative of the heat range. Number one is the coldest, and number seven is the hardest. For example, 111-0111-4 is the coolest variation, and 111-0116-4 is the hottest variation. Customers have testified that the technological sophistication of the spark plug makes it very possible to “feel” the power when using them. One customer testified that they were much more reliable than the original spark plugs that came with your car initially. The spark plugs initially came gapped, though the customer did report that there were occasions where the products did not come gapped, though this wasn’t a major problem. One customer testified that the spark plugs work particularly well with their 2001 Ford Expedition Eddie Bauer. Another customer testified that they installed the spark plugs with their 2001 Crown VIC, and they appear to be exceptionally high quality. In particular, customers are particularly pleased with the fact that there is no need for an aluminum head anti-seize. The package can be purchased for the price of $15.81. Each purchase comes with four copper core spark plugs included in the total package. 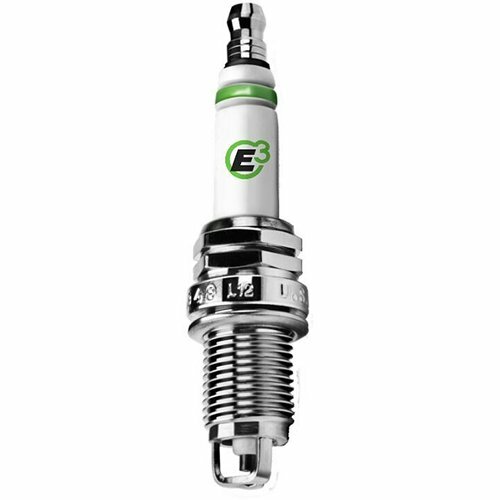 The E3 Spark Plugs are designed to just about completely eliminate the generation of performance inhibiting carbon deposits. Due to the fact that the E3s can eliminate performance inhibiting carbon deposits, they have much more survivability. The DiamondFire technology is responsible for superior intensity of the spark, which creates more localized pressure. The flame front extends further into the cylinder than other models commonly do. The potential power increase is significant, going anywhere from 6% to 12% more, depending on the engine class. The fuel efficiency improves as well, which can be anywhere from 4% to 13% more. There is a highly significant reduction in the potential emission reduction that can happen in 2 and 4-stoked engines, after 50 hours. Some of the reductions include hydrocarbon. Because of the design, there are air gap discharges, which create a much more optimal edge-to-edge spark path. The spark flow allows free replenishment of the spark and a fresh fuel/air charge, along with greater exposure of the flame front to the piston head. The exposure of the flame front to the piston head is superior to what customers often observe in other spark plug designs. Because of the E3 design, there are multiple sharp edges towards the center electrode. The spark flow has a much lower voltage between the edges, which makes the discharge much easier to facilitate than what is possible with standard designs. Due to the fact that the air sparks are created, there is much more resistance to fouling as well. The resistance to fouling ultimately lowers the self-cleaning temperature of the E3 as a whole, which means that it can be used in a colder state. Customers have reported that the distinctive design of the E3 plug creates a significant increase in the engine power output, reduces hydrocarbon and carbon monoxide emissions, extends the lifespan, and leads to a reduction of gasoline consumption overall. DiamondFire technology ensures that the flame kernel is in a more direct position for making contact with the piston, which reduces the overall travel time from the spark so to the end the gases through the open section at the electrode’s top. Because of the short amount of time required to initiate the combustion phase, the flame can reach the piston at a much more rapid pace. The physical feature of the electrode makes it capable of projecting further into the congestion chamber overall, which makes the spark zone much closer to the sweet spots of the air/fuel mixture and creates the most beneficial state of micro-aerodynamics within the spark zone. One customer testified that they purchased the spark plug for their and 98 Saturn SL two, and the first thing that they did was inspect the plugs thoroughly before installing. After some initial testing, the customer reported that the car appears to start up much faster and have more pep in the throttle. The Champion RC7YC Copper Plus Spark Plug has been designed for a high degree of dependability and durability. The RC7YC features a patented SAC-9 semi-conductor resistor for maximum EMI and RF I suppression. The RC7YC features a copper core center electrode which allows it to accurately control the range of heat, increasing the plug’s longevity. The RC7YC features a TinTac and ULTRASEAL shell with optimal corrosion protection, surpassing that of many other spark plug shells in the industry. Whatever spark plug it is that you choose, having a reliable spark plug socket can be quite beneficial for guaranteeing that you are able to conduct the proper amount of maintenance. Familiarize yourself with the different choices in sockets before committing to your final purchase. Every well-educated customer will understand what the value of swivel locking is. Some of the best spark plug sockets will generally feature a swivel locking extension. A socket with a swivel locking extension will provide an optimal angle for turning, as well as the right amount of clearance that you will need for maneuvering in tight spaces. To facilitate the maximum amounts of efficiency, the socket and the extension are both permanently locked together. If you have a high-quality spark plug socket, you won’t need to worry about the socket in the extension ever coming undone. Another critical point of consideration will be an understanding of the value of the spark plug gauge. As a rule of thumb, you should always purchase a gap spark plug according to the specific manufacturer’s guidelines before attempting to install them. In order to properly use the gauge, be sure that you are 100% clear on the specification of the gap. After you have specified the gap, insert the gauge directly between the side electrode and the center electrode. After you have inserted the gauge, the next step is to simply slide the gauge towards the factory specification. There will be a marking in place in order to help you slide the gauge towards the factory specification properly. If this installation is successful, the side electrode should be bent outward, which will create the gap that you need. You should also make a point to have a reservoir of spare coil-on plug boots (COP) in order to mitigate the risk of misfires. Depending on the type of COP style, certain ignition coils have replaceable boots. The need for having replaceable COP has to deal with the firing rate of the voltage. Customers should be advised that voltages with extremely high firing potential may pose a misfire risk. so be sure to confirm whether the boots of yours COP coil can be removed and replaced. If your COP coil is in fact capable of being removed, then you should make a point to replace it in a timely fashion to keep your ignition system in prime operational condition. You will need to constantly invest in having a fresh supply of spark plug wires in order to ensure your safety. If your spark plug lives long enough, then it is inevitable that the wire core conductor will begin to show signs of aging. In addition to the wire core, the insulation surrounding the wire will also begin to slowly break down. In the process of aging, arcing can ensue. If the arcing becomes too severe, you will also run the risk of a potentially detrimental misfire. A misfire that destroys your gas mileage could potentially run the risk of doing irreversible damage to your power train control module and your ignition module. Be sure to always have a backup of spark plug wires to prevent the risk of misfiring from becoming more problematic than it needs to be. Some of the other miscellaneous tools that you might want to be aware of include distributor caps, rotors, anti-seize fluid, boot puller pliers, flexible handle ratchets, and wobble sockets. Distributor caps can be useful when the carbon tip at the center tower’s base begins to slightly degenerate, which could potentially interrupt the optimal level of electrical flow. Proper replacement rotors will be free from the erosion that would potentially cause old rotors to transfer the spark with inadequate electrical resistance. Boot grease can help reduce the risk of voltage leaking out of the boot and getting directed towards the ground. Having a number of flexible handle ratchets will allow you to have the maximum amount of angles with which to remove your spark plugs from hard-to-access angles. Flexible handles can be used in tandem with the wobble spark plug socket, which takes up even less space than a regular socket with an add-on wobble extension usually can. Because older spark plugs have a tendency to become somewhat welded onto the plug that they are tending to, boot puller pliers can be used to safely treat the boots without damaging the connection. Even if you yourself don’t happen to be an auto mechanic or a seasoned vehicle aficionado, the proper amount of preliminary research can make you perfectly capable of qualifying spark plugs. Most of the challenge in properly maintaining your spark plug comes from having a proper stock of tools that can be used to maintain them over the years. Once you’ve invested in a spark plug that has the right amount of power for your needs, make sure that you are ready to address any risks of voltage flashovers, wire degradation, and electrical resistance. Whether you choose a copper design, a single platinum design, a double platinum design, or any other plug type, nothing can compensate for the right amount of preparation and upkeep.